Bred in response to clients wanting a colour marking sire for mating ewes excluded from breeding replacements, this terminal sire is becoming very popular. Like the Texel Coopworth cross, the Texel Suffolk cross enhances desirable attributes from the respective breeds. 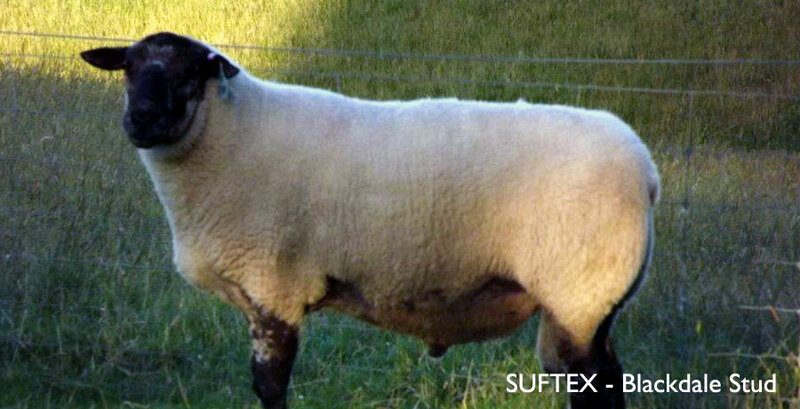 Initially using good growth rate, well muscled Texel ewes put to the best Suffolk sire we could buy and slaughter the ewe progeny, we had to trial Suffolk sires before getting rams which left the dark face colour and hindquarter development we wanted. We are now keeping the best Suftex females and ewe lambs and developing an interbred flock with the aim of all our Suftex having two copies of the Texel myostatin muscling gene and good footrot resistance scores. Progress has been encouraging. Top end Suftex lambs are growing at over 500gms a day to weaning. The top autumn eye muscle area was an 80kg Suftex at 30.4 sq/cm eye muscle area (EMA). Client feedback on the Suftex ram hoggets for hogget mating is very positive. Physical soundness inspections, with dark colour marking, weaning weight, 200-day weight, survival, eye muscle area, fat, growth, footrot resistance, DNA muscling tested. Was wondering if I could get an email or a letter posted in the mail of your ram catalogue. We are interested in your Textra and Suftex rams. 199 Nightcaps-Opio Rd R.D.1 Otautau 9689. Or contact me on 0273421167. Thanks for your enquiry and apologies for the delay in getting a reply to you. If you can email me with your email address then I will be happy to post you a newsletter. Am in England and am going texel ram on Suffolk ewes.